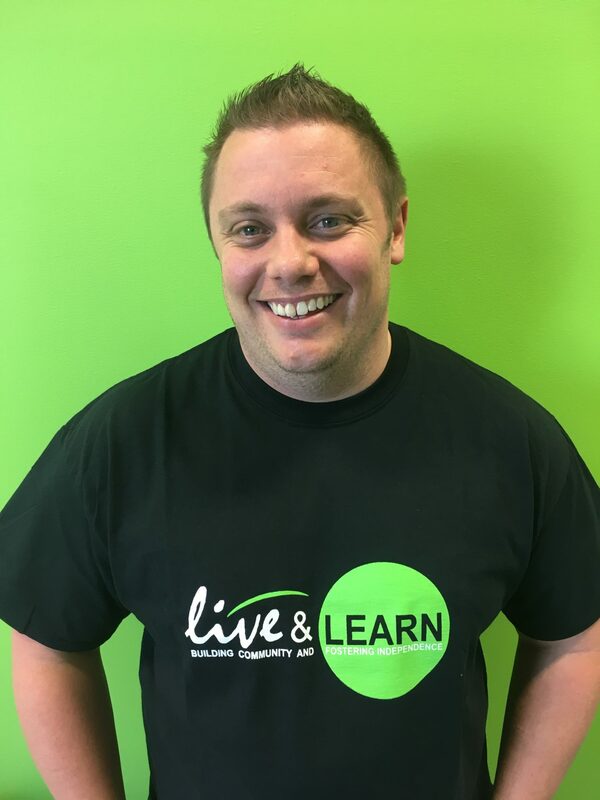 Our Team | Live & Learn Centre Inc.
Jason is an innovative, forward thinking, and tenacious team leader. Over the past 18 years he has worked with people with developmental disabilities in many different capacities. After graduating from Seneca College, Jason found his first job working as a Program Director at Belwood Lodge & Camp. In 2000, his career path led him to public education and he was hired as an Educational Assistant at the Upper Grand District School Board. He worked at John F. Ross High School in a Life Skills program for 12 years, where he held a pivotal role in developing the Special Olympics pep rally and a prom for the School to Community Work Transition program. In 2012, he founded the not-for-profit organization Community of Hearts, to provide programs for individuals with developmental disabilities. Over the years, Jason has spent time volunteering at Special Olympics baseball and coaching the Guelph Giants Ice Hockey team. For his work with people with disabilities, Jason has been recognized with the Access Recognition Award through the City of Guelph and the 40 Under 40 Award from Guelph Life Magazine. 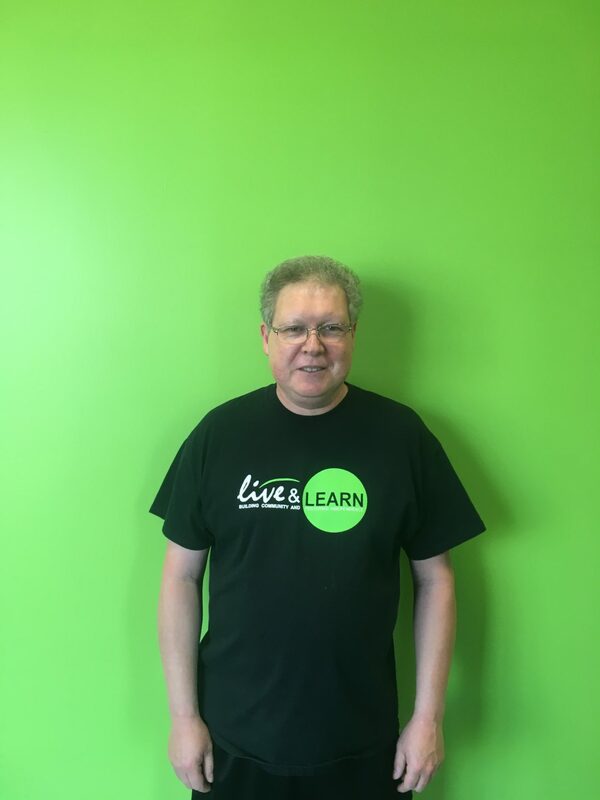 Recently, Jason moved on to a new endeavor, The Live & Learn Centre, a unique business that creates engaging opportunities for individuals with disabilities. Jason strives to provide essential programing that helps participants become more involved in their community, learn life skills, create lasting friendships, and reach their full potential. Andrea’s career in Special Education began in 2006, when she received a full-time teaching position at John F. Ross Secondary School, as part of the School to Community Work Transition program. At John F. Ross, Andrea played a major role in planning social events, including the first prom for students in the program. In 2010, Andrea began working for Conestoga College, instructing the Educational Assistant Program and helping the college transform the program from a certificate to a diploma course. After her teaching experience at Conestoga, Andrea returned to graduate school and completed her Masters in Applied Disability Studies at Brock University in 2013. In 2012, she co-founded the not-for-profit organization Community of Hearts, to provide programs for individuals with developmental disabilities. She also coached the Guelph Giants Ice Hockey team alongside Jason. For her work with people with disabilities, Andrea has received the Access Recognition Award through the City of Guelph and the Everyday Hero Award from the Upper Grand District School Board. Most recently, she helped Jason found his new business, The Live & Learn Centre, and remains closely involved with the new organization. Currently, Andrea teaches at Centre Wellington Secondary High School in the School to Community Work Transition program. 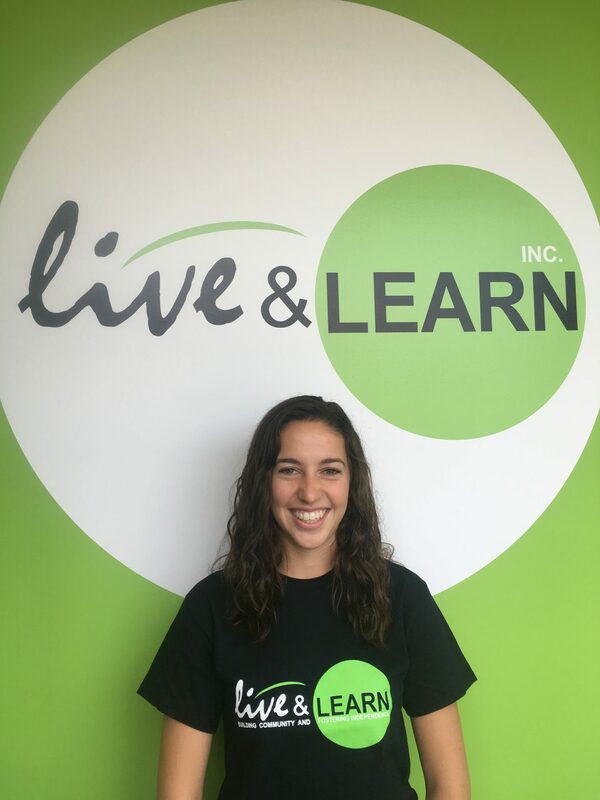 Jillian is excited to bring her experience to the The Live & Learn team as the new Health & Wellness facilitator. Jillian has always had a passion for health, nutrition and overall wellness. Her goal as the new Program Facilitator is to share her knowledge with the participants, so they can live healthy active lifestyles. Jillian obtained her Honours Bachelor of Applied Science from the Applied Human Nutrition program at the University of Guelph (2012-2016). Jillian hopes to bring her knowledge to the program by instilling lessons on food safety and the importance of nutrition. Jillian began her work with adults with disabilities as a program assistant at Community of Hearts and really developed a love for persons with exceptionalities. She expanded her skills through her placement at ARC Industries as a Nutrition Program Facilitator, where she planned and implemented a 10 week nutrition program. She learned about the barriers that are faced by adults with disabilities in the kitchen. Jillian hopes to break down some of these barriers through her work by focusing lessons on food handling, kitchen safety, and basic cooking skills. After graduating, Jillian worked two part-time dietary aide positions at the Village of Arbour Trails and St.Joseph’s Health Centre in Guelph. Both positions allowed her to gain more experience in the kitchen. Recently, Jillian has started a new cooking program at The Live & Learn Centre called “Freezer Friendly”, giving participants the opportunity to gain more experience in the kitchen for independent living. John Rawson has an been a comrade and advocate for individuals with disabilities for the past 18 years. He has been an Educational Assistant with the Upper Grand District School Board. John has extensive experience working with individuals with a range of developmental disabilities. John has sat on the Guelph Community Council for Special Olympics for the past 10 years. He is involved in the Best Buddies program at John F. Ross High School, in addition to the school Championships program for the Special Olympics. John coaches and manages the Special Olympics Powerlifting Club for Guelph. John thoroughly enjoys the outdoors, especially biking and camping. 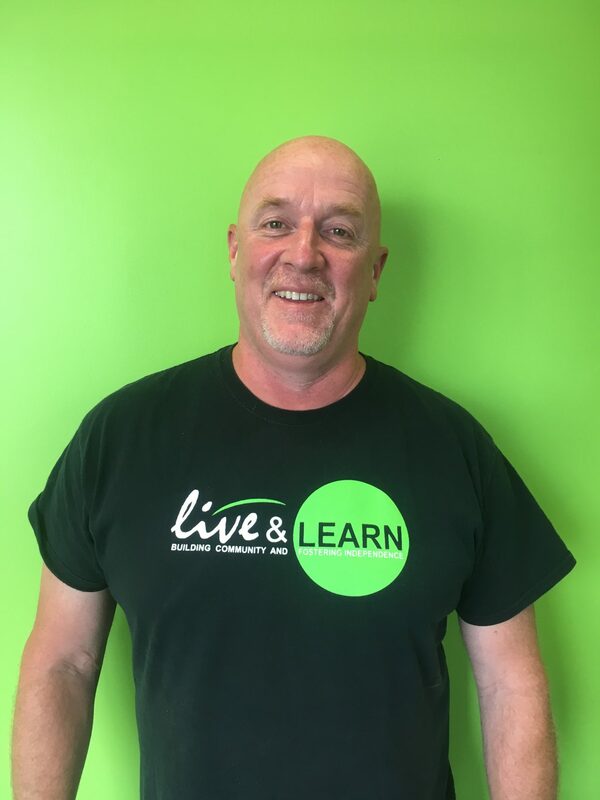 John is the main program lead for Live & Learns Get Fit program where he actively connects participants and their fitness goals with the Guelph community. Since 2016, John has staffed the Cottage Getaways vacation program with Jason and has recently partnered with MMA Guelph to give L & L participants a unique fitness experience. Amanda’s experience in the field of disabilities began several years ago as a volunteer at KidsAbility, where she provided support to children with a variety of physical and developmental disabilities. Amanda then went on to do similar work as a one-on-one support counsellor at a residential summer camp. 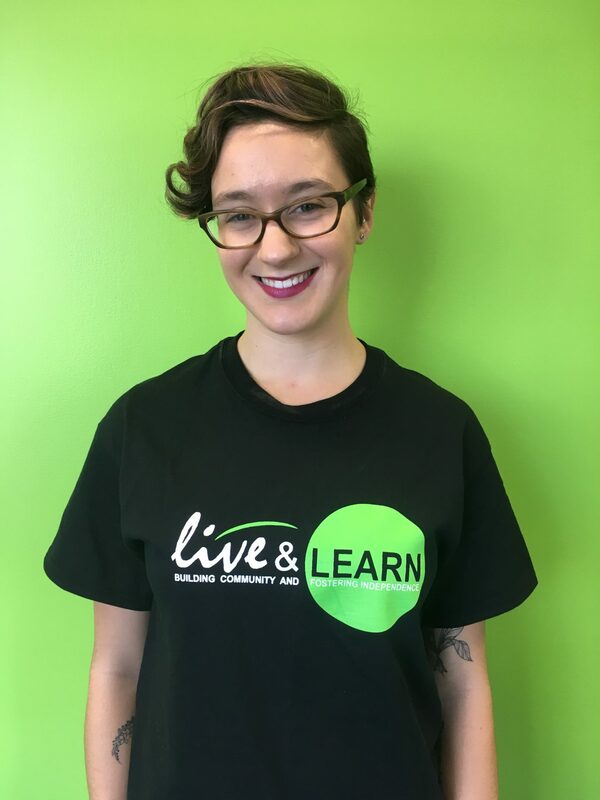 While completing her undergraduate degree in Human Kinetics at the University of Guelph, she began volunteering at Live & Learn and dove into the position of Assistant Program Facilitator in April 2017. In her time at Live & Learn, she has had many fantastic and memorable experiences. These include assisting participants in reaching their fitness goals and mentoring participants on essential life skills with the goal of independence and living on their own. Amanda was also given the amazing opportunity to co-facilitate Live & Learns first ever summer excursion program, including the very fantastic and fun ladies’ weeks of Cottage Getaways! Currently Amanda is attending McMaster University for a Masters of Science in Occupational Therapy. Upon her graduation she hopes to use and apply her knowledge to the field of disabilities and she looks forward to leading Live & Learns summer program in 2018. In her everyday life, Amanda’s interests include fitness, adventure-seeking, and one day travelling the world! In 2016 Bree completed her 4th year practicum from the UofG with the Live and Learn Centre. After completing her degree, Bree became a regular volunteer throughout the week and was later hired in the summer of 2017 to run Live & Learn’s summer excursion program. Bree states that she has yet to find work that is more fulfilling or fun then working with the fantastic team at Live & Learn! Brees most memorable experience was running Cottage Getaways with Jason and Amanda. Bree graduated from the University of Guelph with a B. A. Sc and is currently pursuing a Masters in disabilities studies with a focus on ABA to become a Behavior Analyst. Bree has also worked for the UGDSB as an Educational Assistant, a direct support worker with Community Living and currently provides support services to people with various disabilities and exceptionalities. Barry is know as Live & Learns musical legend and rocking DJ. Barry came involved with Live & Learn through his daughter Caitlyn’s involvement with the L & L program. Being a singer/songwriter and a very talented musician, Barry breaths music of all types and made him a shoe win to volunteer his love of music with Live & Learns Karaoke program. Barry, Caitlyn and his wife Penny (L&L’s bookkeeper) moved to Guelph from Newfoundland in the Spring of 2011. Barry often shares his incredible talents with his church community along with various fundraisers and events in support of senior citizens in the wider Guelph community. Daniella has a degree in Adult Development (B.A.Sc. ), with a minor in Psychology (B.A.) from the University of Guelph. She is also certified by the crisis prevention institute in non-violent crisis intervention, and obtains a recent certification in Acquired Brain Injury. As a recent graduate, Daniella exudes passion and creativity when applying her knowledge of human development into her work. 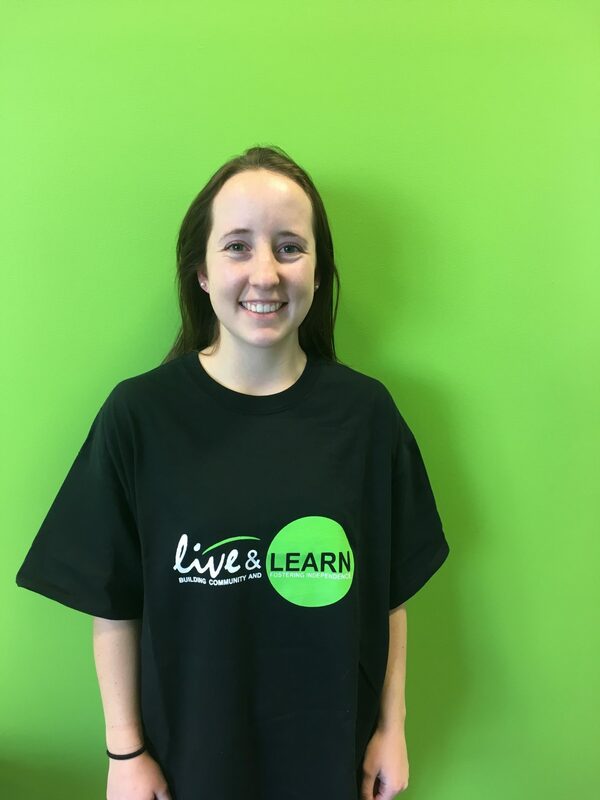 Daniella was excited to become a part of the Live & Learn team in May 2017 as a volunteer, she attended the centre weekly to assist in hosting programs and outings. Her intent was to provide a warm and stimulating environment for participants and to enhance individual growth and independence. She was fortunate to lend a helping hand throughout some of the fantastic summer programs offered at the Live & Learn centre. 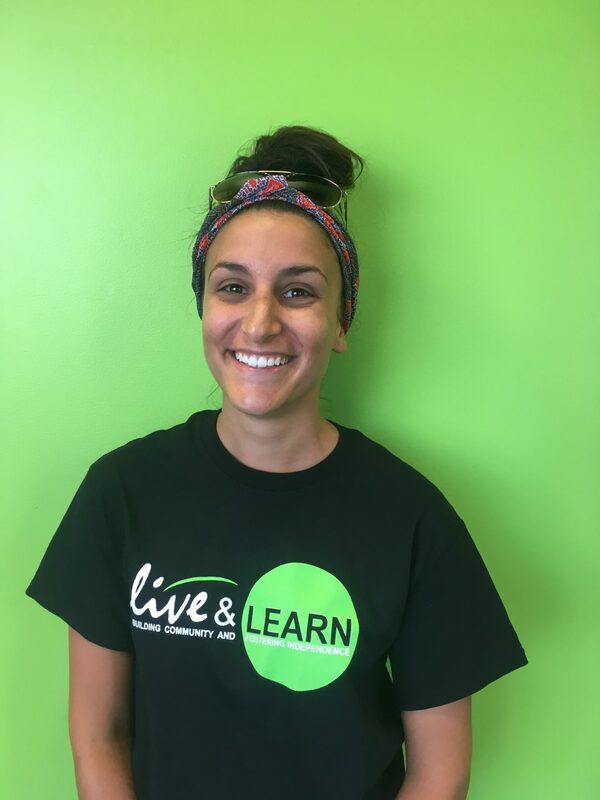 Alongside volunteering, Daniella is also the program facilitator for the Saturday Night Out program offered by Live & Learn. She is responsible for providing a structured process that enables participants to build problem-solving skills and make high-quality decisions. She is focused on ensuring the participants have a fun-filled outing with peers in a safe environment! Additional to her experience with persons who have developmental disabilities, Daniella is very passionate about the work she contributes to the field of Mental Health and Addictions. She dedicates a majority of her time to being a Residential Support Worker for Dunara Homes for Recovery in Guelph. Within the organization, Daniella also works as a Passport Worker for clients who have extraordinary needs and, as a Residential Crisis Respite Service Worker for persons in the community who are experiencing an immediate crisis and are seeking assistance. Given the opportunity to live abroad for a number of years, Daniella was granted the ability to learn various cultural backgrounds and environments, which she believes has helped shape her into a compassionate and dedicated worker. Naomi is a Human Services graduate who is continuing her studies at Conestoga College with the goal of becoming a recreational therapist upon graduation in the spring of 2018. Naomi has been involved with persons with disabilities since she was in her third year of high school. 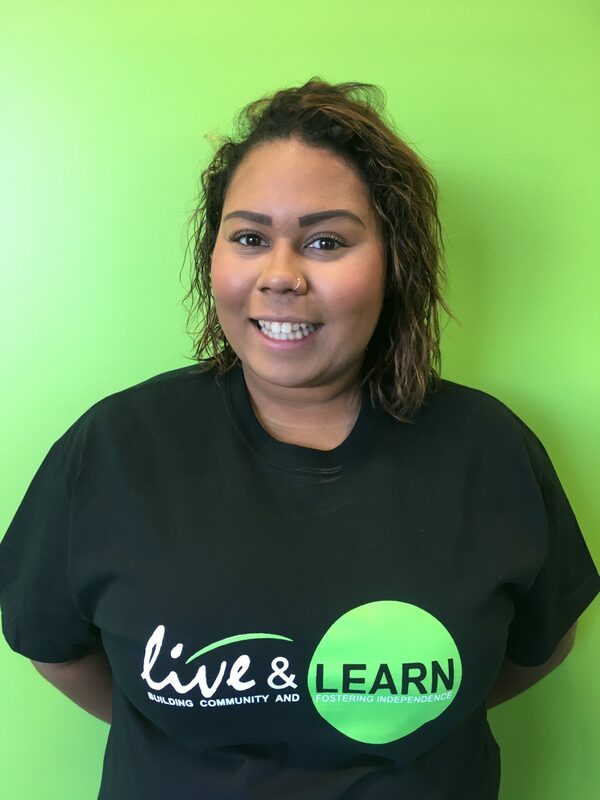 Naomi joined the Live & Learn centre upon opening in 2016 in which she volunteered her time working with the Friday group. Naomi has been attending the Wednesday night Karaoke program with a client she supports. She states she does not have the best voice however she loves interacting with the participants and loves listening to everyone sing their favourite tunes. Naomi has been recently hired by Live & Learn to run the Karaoke program with Rock Country legend Barry Parsons on Wednesday nights. Naomi looks forward to seeing new and returning faces at Karaoke! Penny has had a crucial role in the startup of the Live & Learn Centre. 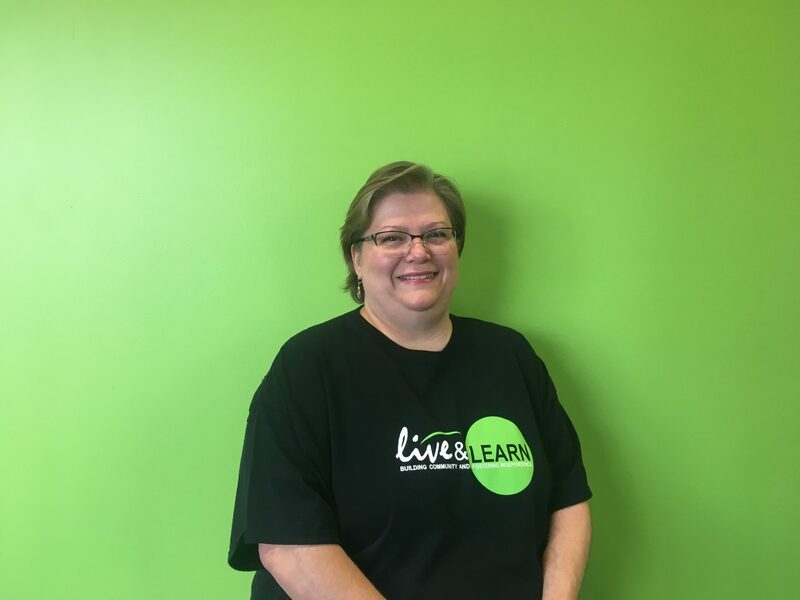 Before Live & Learn’s doors opened in September of 2016, Penny provided Bookkeeping and human resource services to Jason & Andrea and enrolled her daughter Caitlyn into the program. Penny has a successful business of her own called Pennies Bookkeeping. Penny has been working in the bookkeeping and office management field for more than twenty years and since moving to Guelph from Newfoundland in 2001 she has completed a Human Resources Management Diploma from the University Of Guelph. Like her husband Barry, she too is a talented singer and volunteers with her church community and fundraising events. Penny has a love for baking, cooking and being creative with her own recipes. During tours of the Live & Learn Centre, Jason refers to the office as where the magic happens and it’s easy to see from the passion and love Penny puts into her work. 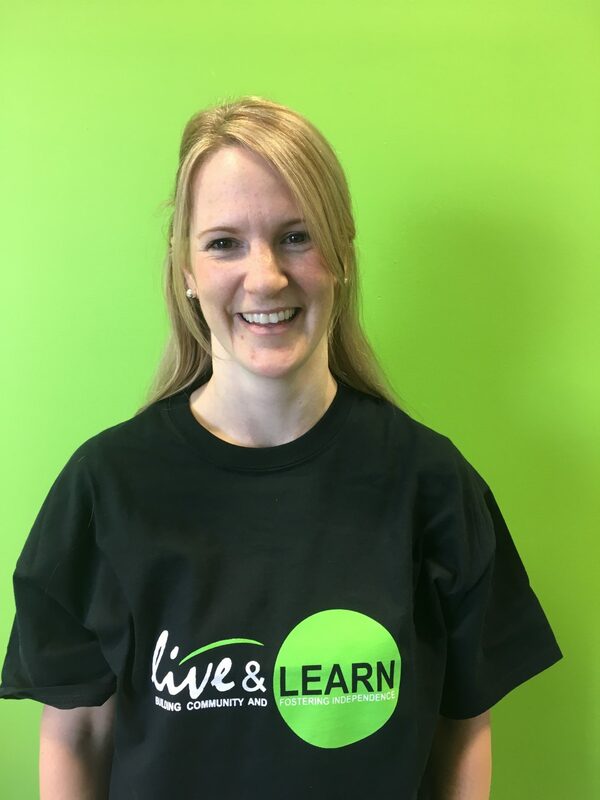 Penny is a valued member of the Live & Learn team and is looking forward to her role growing with the Centre. Alix has worked with children and adults with varying needs for 10 plus years. Alix began working in the field by volunteering with Special Olympics and providing respite care for families. From there Alix began working at Belwood Lodge & Camp, a camp for children, youth and adults with special needs. Through her career Alix has continued to work at Belwood and is now the Associate/ Program Director. Alix is commencing her 5th year working with Hopewell Children’s Home with the children they support in their respite program. Alix volunteers with the Guelph Giants Special Hockey Club, coaching their junior team. Alix is also the Head Coach of the Adapt Aquatics program with the Fergus Phantoms Special Olympics team. 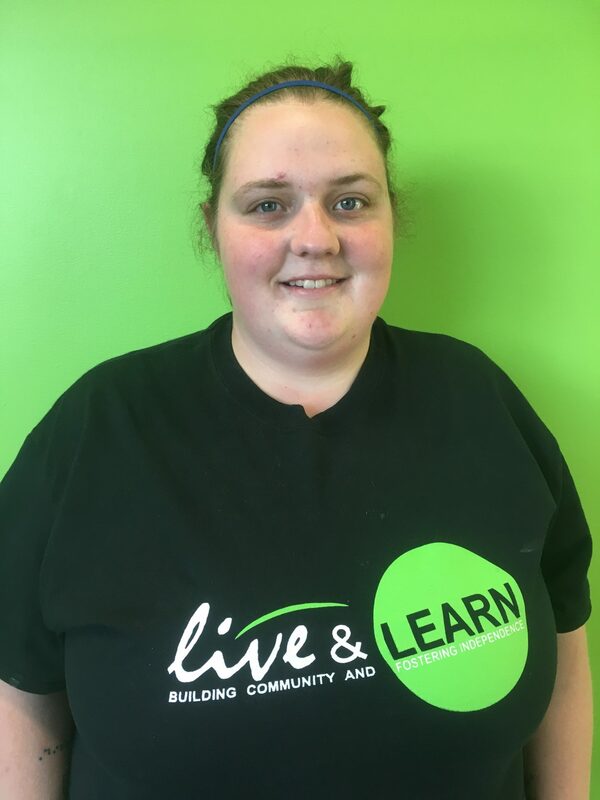 Alix will be working at Live & Learn executing the Tween Program, Friday night Program and occasionally during the Day Program. Alix is beyond excited to be working with Live & Learn and can’t wait to see everything we are going to accomplish.  Want to learn more about the Live & Learn Centre?